l-r; Trish Noe, Vonda McDaniel and Dylan Lancaster say new tip rules constitute wage theft. 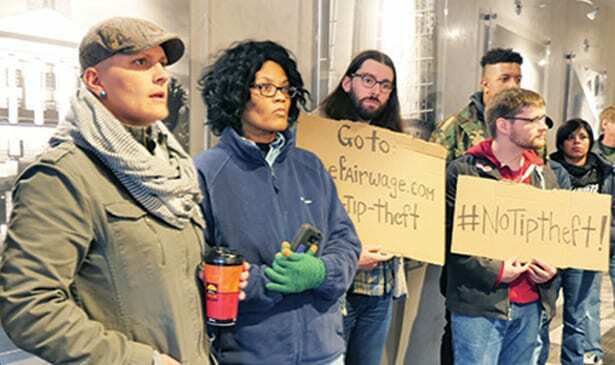 NASHVILLE, TN — Restaurant workers worried about a threat to their tip income delivered hundreds of petition signatures Friday to the Department of Labor offices here. The petition opposes a proposed rule change allowing employers to use tip income for business expenses. “The Department of Labor withheld an economic impact analysis from the public because it shows an estimated $5.8 billion in wages that would be transferred to employers’ pockets should this rule go through,” said Trish Noe citing a Bloomberg Law report on the rule change (#RIN 1235-AA21). Noe is a service industry spokesperson. The rule change will force workers in restaurants, valet parkers, hair salon workers, and hotel workers to turn over all tips to the owners of the business where they work. Owners are then free to distribute the tips among other untipped workers like prep staff and cooks in the kitchen. But those owners also are free to use the tip money to pay for “capital improvements” in their businesses, or things like reducing menu prices — as long as their workers make federal minimum wage which is $7.25 an hour in Tennessee. This makes it possible for owners of businesses to use tip income for business expenses or to lower prices to consumers rather than to supplement historically very low hourly salaries of their employees. McDaniel characterized it as a continuation of Trump era taxes benefiting the wealthy. “It is a reversal of money in this country – we saw tax cuts before Christmas and now here we are again in taking from the folks who need it the most,” McDaniel said. ”If employers have trouble retaining non tipped workers because they are paid so bad[ly] then the solution is for the company to raise their wages. Not to essentially steal what tipped workers take home at the end of their shift. Tipped restaurant workers already have the lowest federal minimum wage of just $2.13 an hour. Which generally isn’t even enough to cover our tax liability,” said Noe. Noe pointed out that the proposed change in Labor rules was introduced with only days for public comment. “Under the Obama administration the Labor Department regulations stipulated that tips always belong to the employees regardless of whether they are paid the tipped wage or the federal minimum wage of $7.25,” said Noe. Dylan Lancaster who is a musician and restaurant worker predicts it will negatively affect tourism and the music industry. “The guise the rule is trying to portray that the tips will be equally distributed but nothing in the rule says that the employers have to do that. I also play music. If this rule goes through I will have to stop doing what I’d like which is a huge part of the industry here in Nashville. I think it would very negatively affect tourism and the industry here in Nashville,” said Lancaster. “We represent the people who serve your food, who park your cars, who cut and color your hair, who carry your bags for you and who make your extra dirty martini shaken not stirred. We want the Trump administration, the National Restaurant Association to hear our collective voice,” said Noe.